Who are these name changers? Are they Bristolians, born and bed here of Bristol families, educated in Bristol Schools, worked hard to buy their own houses, and pay council tax? How dare they come here from other cities and countries and tell us what to do? Aunt May, Betty Brant, J. Jonah Jameson, Frederick Foswell + Mr Merriweather, the Business Executive Club and their butler, and a chorus of gangsters and policemen. Liz and Flash do not appear. Parker is wearing blue trousers (jeans? ), a black open top shirt and white jacket throughout this episode rather than his normal blue suit and yellow waistcoat — possibly because the story takes place on a Saturday? Failure to Communicate: On page 7, Peter Parker returns to Aunt May's house, retrieves his Spider-Man costume, changes clothes and goes into action. But on page 19, he retrieves those same clothes from an alley near the warehouse where the fight with the Green Goblin took place. 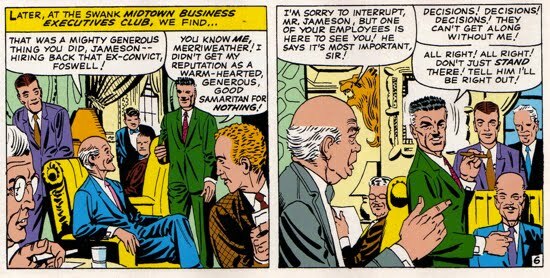 For the third consecutive issue, J. Jonah Jameson is represented as a comedy hypocrite who wants to be thought of as a public spirited citizen, but not particularly as a detractor of Spider-Man. Possibly Lee thought the character had become too one-note, or wanted to undo the damage done to him in the Scorpion story? Spins a web, and size: Uses liquid webbing to block up gangster's guns; puts liquid webbing on gangster's back and throws him against the wall; puts pool of liquid webbing on floor to trap gangsters; puts web net on ceiling so gangsters are trapped as they come into room. No wonder he's run out of the stuff by the end of the episode! Peter Parker’s financial position: He forgets to take photos of the arrest of the gang — maybe because he still has $8,000 in the cookie jar? p6 “Before his arrest, Foswell was the kingpin of the rackets” The words “king of crime” and “kingpin of crime” are used interchangeably. A kingpin originally meant part of a wheel pivot in a car; but it was in use to mean a Mafia boss by the 1950s. The big bald guy known as The Kingpin won’t appear until issue #50.
p8 “It’s like a scene from The Untouchables” The Untouchables, a TV series about Eliot Ness and Al Capone, finished its run about the same time Amazing Spider-Man started (May 1963). Stan just can't resist lamp-shading this kind of thing. p9 “We’ll have to close down all our gambling joints.” Up to now organized crime has mostly been interested in stealing stuff. A gangster decides that he is going to fill the still-vacant role of “king of crime” in New York. He tries to muscle in on Lucky Lobo, one of the current bosses (who looks disconcertingly and irrelevantly like Jack Kirby). One of Lobo’s henchmen gives him information about his boss’s criminal businesses, and the gangster leaks them to a newspaper. He intends that the police will arrest Lucky Lobo for tax evasion (as sometimes happens to famous gangsters) leaving the gang ripe for a takeover. But the plan works too well: the police don’t just arrest Lobo himself, but also his entire mob, leaving our friend with nothing to take over. The end. The gangster who gets hoisted on his own petard is the Green Goblin, and the newspaper which breaks the story is the Daily Bugle. It isn’t quite the “cops and robbers” tale Stan Lee promises on page 1 — no-one does any robbing at all — but it’s quite a decent little gangster yarn; the kind of thing which could well have occupied a few pages of Crime Does Not Pay! or Justice Traps The Guilty! The only thing missing, is, er, anything very much for Spider-Man to do. He has a fight with Lobo's mob and ties them up with webbing before the police arrive; he has a big and inconclusive fight with the Green Goblin; but the story would have been very much the same if our hero hadn’t been in it. Was this an intentionally avant garde bit of plot construction — life carries on and Spider-Man isn’t always at the center of it — or yet another example of Lee and Ditko not being able to work out what the hell to do with the post-triptych Spider-Man? Not only is Spider-Man incidental to the breaking up of Lobo’s mob; but his fight with the Green Goblin ends in an impasse. This is rather well choreographed: the Goblin finds that his bag of tricks is empty and flies away. Spider-Man tries to go after him, but finds that he has run out of web (not surprising, given the amount he has been wasting sticking gangsters to floors and ceilings). He tries to jump after the glider anyway; misses; and has to do a dramatic maneuver to land safely. This is the kind of thing that Stan Lee means when he points to the comic's realism: there aren’t a lot of other comics which would have left a big fight between hero and villain unresolved. Stan Lee will later backfill this as the Goblin's unique selling point: post-Ditko the Goblin is very much rebranded as “that foe whose battles with Spider-Man were always inconclusive." The actual fight takes place in some kind of boiler room: quite where, we aren’t told. Spider-Man and the Goblin just crash through a skylight into a room full of pipes and girders. It will be remembered that Spider-Man fought Doctor Octopus and Mysterio in an artist’s studio and and on a movie set, respectively. When Ditko can see that a fight scene is a little pointless, he often drops the antagonists into an unlikely location. Back in issue #10, the incumbent King of Crime — the Big Man — was revealed to be a Daily Bugle journalist named Frederick Foswell. Having served his time in prison — a whole year! — J.J.J. decides to give him his old job back. In issue #10 Foswell was very specifically a columnist and leader writer, but now he is equally specifically an investigative reporter and a crime specialist. Issue #10 involved a fairly clever piece of misdirection: everyone, including Peter Parker, thinks that The Big Man is Jameson, but actually he's Foswell. This issue goes out of its way to imply that Foswell is the Green Goblin. On page 6, the Goblin meets a gangster who gives him Lucky’s tax details. The Goblin says that he wants to make the list public, “and knows just the way to do it…”. On the very next page, Foswell rushes into Jameson’s private club with the papers. The hint that Foswell and the Goblin are one and the same could hardly be more explicit; and no other explanation of where Foswell got the papers is proffered. On page 5, Parker sees Foswell talking to some hoods, but can’t follow them because he doesn't have a costume with him. This could be another example of Stan Lee's realism: he might just have dropped in the idea that Spider-Man has to wash and dry his costume from time to time because as an amusingly naturalistic touch. But in plot terms, the only repercussion of the wet costume is that Parker can’t tail Foswell when he would like to. Quite a lot of narrative effort is expended to make Foswell appear mysterious. In issue #27, we will find out what Foswell is really up to. But that is not remotely hinted at or foreshadowed here. You will search in vain for a cameo by Patch the Informer in this issue. Ditko makes a lot of use of background characters and extras, whether it is the generic group of boys who hang around with Flash Thompson; Liz Allan’s girlfriends; or the ever-present chorus of Bugle-reading men-and-women in the street. But this isn’t some random face in the crowd: he will pointedly appear again in issue #25 (when Peter highlights him as “someone important”), and again in a club scene in #27. Indeed, one might suspect that the only point of introducing Jonah’s club is so we can be introduced to him. If you are a spider-fan, you can, instantly identify him as Norman Osborn, although he will not be given that name until #37. In issue #39 it will be revealed [SPOILER] that Normal Osborn was the Goblin all the time! So what is going on here? 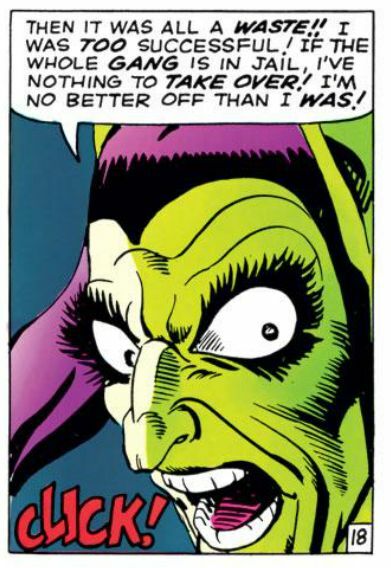 Did Lee and Ditko know all along that the Green Goblin would eventually turn out to be J.J.J’s friend from the club, while laying a false trail that he's Foswell? Or do they at this point intend Foswell to be the Goblin, only to backtrack in a few issues time? 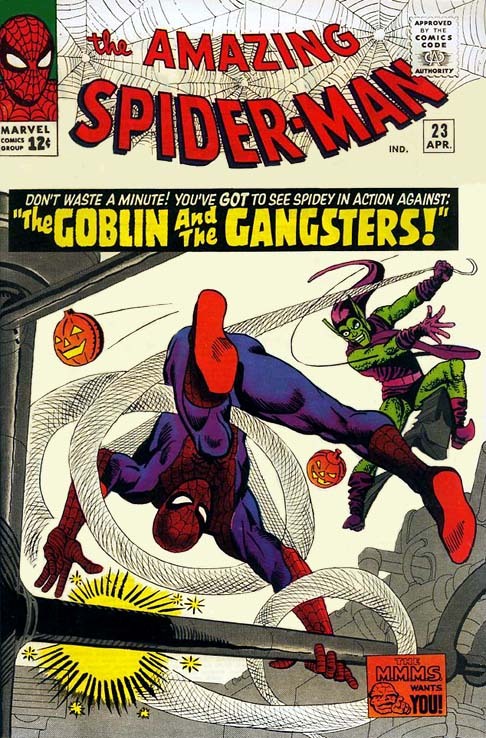 Fan lore states that it was the identity of the Goblin that Ditko and Lee fell out over. I don’t believe this myself. But I think this issue shows just bad their relationship was getting. Ditko foreshadows the Goblin’s unmasking, and sets up a situation where Spider-Man's worst enemy is Jameson’s comrade, and Lee doesn’t bother to write a speech bubble or caption to ramp up the suspense. I am inclined to believe Ditko’s account. He knew Osborn was the Goblin from the off; and is seeding a plot far in advance. But he didn’t bother to tell Stan. Or if he did tell Stan, Stan didn’t care. How should we see this issue? Maybe Lee and Ditko wrote a deliberately inconsequential issue in order to remind us that the Green Goblin is still around, reintroduce Foswell, and underline Jameson as a public figure. Or maybe Ditko wanted to do a substantial gangster story and found that it got hijacked, as so often in the past, by a super-villain fight scene. We’re going to get a much chunkier tale about the Goblin, Foswell and the Mob in three issues time. (It will also feature an unwearable spider-costume, interestingly enough.) Should we see that as Ditko’s attempted to redo this episode the way he wanted to? Or is this a deliberately slight tale an intentional curtain raiser for the big one?